1. The Narratio de Itinere Navali is a somewhat unknown medieval work. How did you come across it and what attracted you to it? It amazes me that I was working professionally as a medievalist specializing in the early Crusades for five years before I came across it! 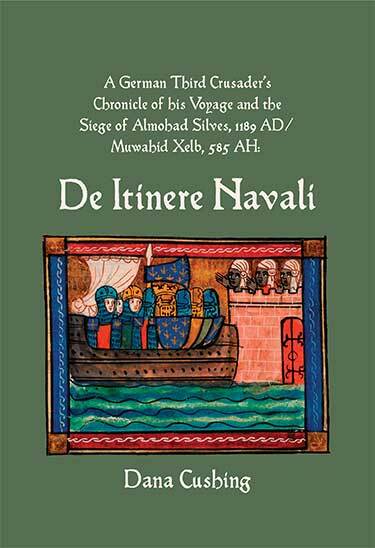 The De itinere navali is a short but information-dense eyewitness testimony that survived in to our time as a chronicle fragment, and despite the small size of its surviving fragment, the reader can easily visualize this one man’s crusading journey as he was living it. One day just before the turn of the millennium I was in the stacks at Robarts Library (University of Toronto) looking up another Third Crusade source and happened to notice this small and elderly brown book that had been placed beside the sorted books on the shelf. This was the Silva Lopes edition. I didn’t then know any Portuguese, but I did read the Latin part of the book and it was “medievalist catnip” – one of those wonderful nineteenth-century scholarly editions that had slipped under the radar because it wasn’t written in the usual academic languages! This doesn’t happen so often anymore with Google Books, but back then it was sheer luck finding such things and Robarts had so many nifty old books that it was always a delight to explore there. I was then close to completing my first book, so I knew right away what my second book would be! The other interesting story is the manuscript’s survival itself – it was nearly destroyed three times in the past two hundred years alone! Who knows how many narrow escapes it had just from war, fire, neglect, ignorance, and so forth before that? Its story is itself a harrowing tale, recounted full in my book’s Introduction – and, as I learned through translating the contemporary Portuguese forais (charters) that are presented in my book’s Appendices, there was at least one more eyewitness to these events whose manuscript did not survive. So much work remains to be done in European manuscript collections that I hope more manuscripts will be found, recognized, and preserved before these medieval voices are forever silenced – and that the formal study of palaeography makes a comeback (so many universities have cut it!) so that we can have more medieval documents accessible to non-specialists. I really encourage students interested in the Crusades to study Arabic, we’re still missing half of the story and the Arabic sources proved key to puzzling out some of the De itinere navali information. E-book technology didn’t exist when I began this work but, now that we have it, the De itinere navali’s many narrow escapes helped convince me that making knowledge accessible in many formats in many locations will help to ensure its survival. Aside from the “Indiana Jones” aspect of tracking down and rescuing this historical artefact (this manuscript), it was the Crusader’s candid style and his experiences that kept my interest. His first lines communicate his purpose: To educate his audience, using plain language. I’ve tried to convey his style and spirit of writing as directly as possible in my translation. It’s an engaging text because the Crusader had never travelled so far before, so we are exploring right along with him. For example, he was fascinated by this weird flying fish that followed his ship – he’d never seen a dolphin before. There are a few of these personal moments in the text that really grabbed me. So often with Crusades chronicles you are dealing with very formalized and theological speech, but here we understand this Crusader as a regular man who just happens to be 800 years older than us. Yet his testimony is very terse, so I’ve brought my own combat experience into the essays accompanying this translation, explaining what both the Crusader and the townspeople experienced during the siege so that a layman can grasp the mental and emotional information conveyed but not elaborated. Not many medievalists are combat veterans so I felt that was a contribution that I could make for a modern audience. 2. We think of the Third Crusade as a war fought in the Near East, over Jerusalem. How does the story of the conquest of Silves in 1189 fit in with how we look at this conflict? Without the Atlantic Crusades, there would be no Jerusalem! Without the sea-borne Crusaders, there would be very little crusading at all, let alone retaining the areas annexed! The Mediterranean Levant zone was the conflict more people are familiar with, although to date more focus has been placed on the land battles in the Kingdom of Jerusalem and Saladin’s empire, rather than the maritime struggles and the Muwahid empire. Silves was one step in that long process of recovering major harbours (and thereby the inland areas) of the Iberian Atlantic coast for use by the Crusaders using the Atlantic route to the Holy Land. My book explains how the medieval crusaders realized the overland route was not an option – the De itinere navali says this explicitly – and even Emperor Frederick I was encouraging people to crusade by sea and giving them ships, although he personally went by land because he was scaphaphobic (afraid of boats). Also, geographically, certain people (England, Frisia, Scandinavia, etc.) were going to have to sail just to get anywhere anyways. It was a colossal waste of time and resources it was to use the Danube/Constantinople sailing route, never mind the Byzantine problem. I think, and I’ve said in the book, that we need to re-examine the land-based crusading as an exception, that sea-borne crusading was the norm: This is explained fully in my book, as a theme throughout the Introduction. My prior work (http://www.academia.edu/777534/The_Atlantic_Crusades) explains in detail the pre-Crusades history of the Atlantic Iberian zone and how it developed into the situation you have by the Third Crusades, with the Atlantic crusading forces deliberately attacking the harbour cities of the Atlantic Iberian zone, while the Italian and French crusading forces worked on the Mediterranean Iberian zone, and while the Sicilian forces worked on the Mediterranean African zone. So there were four fronts of the Crusades, when you take the maritime view. The Muwahidun perceived this and, after they overthrew the Moravid empire in the second part of the twelfth century, they strove to become a naval superpower in order to deal with this. The Emperor Yusuf Ya’qub al-Mansur went so far as to establish and equip from scratch an entire new Admiralty, stationed at Ceuta and tasked specifically to deal with the Iberian Atlantic zone, of which Silves was a part. This naval base is mentioned in De itinere navali and, in my book, I’ve explained in detail about the Muwahid Empire as a maritime-dependent polity. Basically the Muwahidun required control of the same waters for their Iberian possessions as the Crusaders did for securing their passage and resupply to their possessions in the Holy Land. In both cases, each “side” of this conflict was fighting for its logistics – safe passage and sources of supply. What we need to research now is, was this was a coordinated effort to ensure Christians had passage from Atlantic Europe through to Jerusalem? To date, these struggles have been framed as completely different types of crusades, or as anti-piracy efforts. We need to fix that: Silves was one part of the future of the “Outremer” of the Muwahid Empire empire, not just a siege coincidental to a voyage by some Europeans Christians en route to struggling for their “Outremer” in the Holy Land. So I began writing this book in the Jerusalem-centric, land-based view, but as I learnt more I recast it into the logistic-centric, sea-based view. 3. This text offers historians quite a lot of information. You have used the work to take a closer look at ships and navigation at the end of the twelfth-century. What do you think are some of the other ways historians can make use of this text? There is truly something here for everyone! As well as the obvious maritime value I’ve mined from it, there are questions of military technology (e.g. the “hedgehog” siege-device question arising from this text) and practises (e.g. the indication that the Order of the Holy Sepulchre not only existed, but possibly as an institution coordinated receiving the inbound Crusaders). Plus seafaring, archaeology, intelligence, battlefield medicine and psychology, the Muwahidun’s internal political and military conflicts, geography, finance, trade, theology, law, mathematics, numismatics, technological history, palaeography, comparative literature, linguistics, socioeconomics, statistics, art history, law, and even romantic poetry of the era that I bring forth to give De itinere navali its contemporary connections and contexts. Note too that this book includes two Portuguese documents that deserve our attention: the Foral Alfonsino (Lisbon, Torre do Tombo, Shelfmark “Doações de Afonso III”, Livro I, folio 82v) and the Crónica de Portugal de 1419 (Porto, Shelfmark 886, presently attributed to Fernão Lopes). Unfortunately I couldn’t get permission to reproduce Kürth’s work on these Crusaders, but it’s linked in the book and also very rewarding. There’s a lot of scholarship being overlooked because it’s not in English or at least not well-known due to its age or location. So It was great for me to push myself beyond my own specialty, beyond my own field too, and I hope my work will encourage others to cross disciplines when they research. There are several places in the footnotes where I’ve asked for scholars in other fields to contribute information, or I’ve suggested further lines of study within Crusades history. There is a body of Portuguese work about the twelfth-century crusading there that is difficult to access and, with the language barrier, hasn’t received the attention it deserves; likewise, I’ve encouraged people to dig into the Arabic-language sources concerning Morocco because I think we’ll find some good material in there that is missing from our understanding today. That was another reason for publishing the ebook format as well as the hardcover format, so as we all learn things we can add to this manuscript’s story. I really hope De itinere navali will inspire more questions and research!